This Southern Style Chicken and Dumplings Recipe is easy to make and full of old fashioned goodness. You’ll love the flat dumplings mixed in with a delicious creamy chicken soup. Chicken and Dumplings is a classic Southern comfort food. It starts with a creamy chicken soup. Celery and carrots are optional vegetable additions to the soup base. Strips of biscuit dumplings are cooked directly in the soup base. 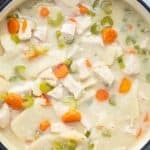 You can find a wide variety of methods and preparations out there for chicken and dumplings, particularly when it comes to the dough for the dumpling itself. This method uses the Southern-style strip dumplings that are similar to noodles. We also have a recipe for a more European style drop biscuit chicken and dumpling recipe with a non-creamy soup broth. You can add vegetables to the soup base, as written in this recipe, or you can leave them out. A frozen veggie mix like peas and carrots will also work as a time saver in place of the vegetables as listed. Dumplings vary from being flat and noodle like, to being more like a drop biscuit. This will depend on your region and personal preferences. This particular recipe uses the flat noodle strip dumplings. It’s a simple dough with only a handful of ingredients that is rolled out and cut into strips. The strips are then dropped directly into the soup base and cooked. You can use either buttermilk or regular milk to make the dumplings. This Southern Style Chicken and Dumplings Recipe is easy to make and full of old fashioned goodness. You'll love the flat dumplings mixed in with a delicious creamy chicken soup. Heat a large dutch oven pot over medium high heat. Add in olive oil and heat through, 1 minute. Add in celery, carrots, and onion and saute 5 minutes, or until onions are soft and translucent. Stir in garlic and cook 1 minute more. Add in chicken breasts and season with salt and pepper. Pour in chicken broth and milk. Bring to a boil and boil 20 minutes, or until chicken is cooked through and easily shreds with a fork. Meanwhile, make the dumpling dough. Mix flour, baking powder, and salt in a mixing bowl. Cut in the cold shortening using a pastry cutter or food processor. Gradually pour in the buttermilk, stirring until the dough comes together. Turn the dough out on a floured surface and work it just until everything is well combined. Roll the dough out about 1/4-inch thick. Cut into 1 inch strips. Cut each of those strips into pieces that are approximately 2 inches in length. 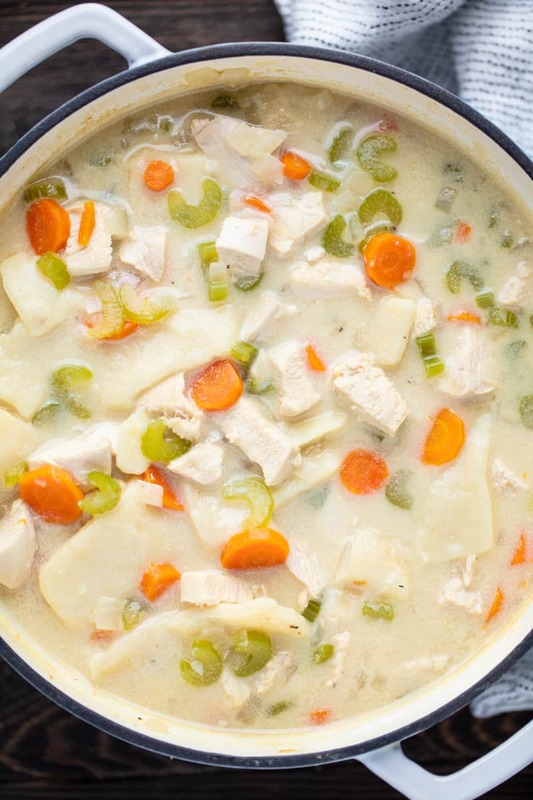 Shred chicken directly in soup pot, or remove to a cutting board, shred, and return to soup. In a small bowl, whisk together cornstarch and water. Pour into soup pot, stir in, and return to a simmer. Drop strips into the soup and simmer 15-20 minutes. Serve hot. JUST the recipe I wanted for today! my only changes were “drop” biscuit, and the addition of 1/2 cup of chopped “Baby Bella” mushrooms (I’m hooked on them. On another note, a recent;y read (and now DO) the garlic a bit differently. I add chopped fresh garlic for the last 10-minutes or so rather than oil/onion/celery/whatever… it really does give a “Fresher” garlic taste that is not stronger – just really ‘pleasant’.